Here is a fantastic Open Source review from ALD Lab Dresden (IHM, TU Dresden) on Flash Enhanced ALD coming from one of the probably coolest ALD tools today - The FHR.Star.100-ALD-PECVD-FLA (see below). Not all capabilities are reviled in this paper so you should stay tuned for more from Thomas Henke. Configuration of the FEALD process station comprising the flash lamp unit and the cross-flow deposition reactor. The small arrows illustrate the gas flow directions. Direct Ethanol Fuel Cells DEFCs are considered one of the promising renewable energy sources, as they can produce electrical energy directly from the ethanol electrooxidation reaction. The efficiency of ethanol electrooxidation is a big question from research point of view. Here French and Canadian researchers show how ALD Pd nano particles grown in anodic titanium oxide nanotubes can be used for Ethanol Electrooxidation. Palladium nanoparticles are grown on TiO2 nanotubes by atomic layer deposition (ALD), and the resulting three-dimensional nanostructured catalysts are studied for ethanol electrooxidation in alkaline media. The morphology, the crystal structure, and the chemical composition of the Pd particles are fully characterized using scanning and transmission electron microscopies, X-ray diffraction, and X-ray photoelectron spectroscopy. The characterization revealed that the deposition proceeds onto the entire surface of the TiO2 nanotubes leading to the formation of well-defined and highly dispersed Pd nanoparticles. The electrooxidation of ethanol on Pd clusters deposited on TiO2 nanotubes shows not only a direct correlation between the catalytic activity and the particle size but also a steep increase of the response due to the enhancement of the metal–support interaction when the crystal structure of the TiO2 nanotubes is modified by annealing at 450 °C in air. Here is an interesting open access paper by researchers at University of Liverpool for all of us zirconium lovers from a special issue Atomic Layer Deposition of Functional Materials, http://www.mdpi.com/journal/materials/special_issues/atomic-layer-deposition edited by Peter J. King. It is fantastic to see how even low amounts of Zr can improve sort of any material including even ZnO. 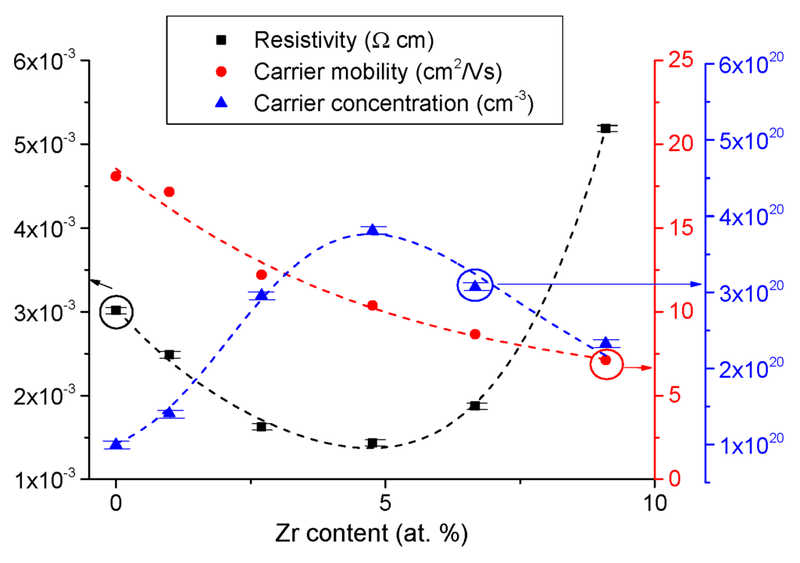 Zr doping dependence of resistivity, carrier concentration and mobility for ZnO films ~85 nm thick. Transparent conducting oxides (TCOs), with high optical transparency (≥85%) and low electrical resistivity (10−4 Ω·cm) are used in a wide variety of commercial devices. 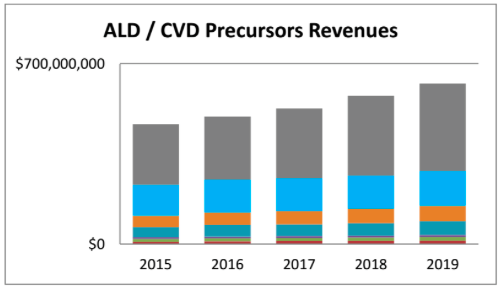 There is growing interest in replacing conventional TCOs such as indium tin oxide with lower cost, earth abundant materials. In the current study, we dope Zr into thin ZnO films grown by atomic layer deposition (ALD) to target properties of an efficient TCO. The effects of doping (0–10 at.% Zr) were investigated for ~100 nm thick films and the effect of thickness on the properties was investigated for 50–250 nm thick films. The addition of Zr4+ ions acting as electron donors showed reduced resistivity (1.44 × 10−3 Ω·cm), increased carrier density (3.81 × 1020 cm−3), and increased optical gap (3.5 eV) with 4.8 at.% doping. The increase of film thickness to 250 nm reduced the electron carrier/photon scattering leading to a further reduction of resistivity to 7.5 × 10−4 Ω·cm and an average optical transparency in the visible/near infrared (IR) range up to 91%. The improved n-type properties of ZnO: Zr films are promising for TCO applications after reaching the targets for high carrier density (>1020 cm−3), low resistivity in the order of 10−4 Ω·cm and high optical transparency (≥85%). Screendump showing the ultimate goal of integration III/V vertical nanowire transistors. "Driven by the growing demand for increased communication and increased mobile and server data traffic, CMOS technologies will require continuous innovations in the field of ultra-low power operation, performance and density scaling. And this at an affordable cost. 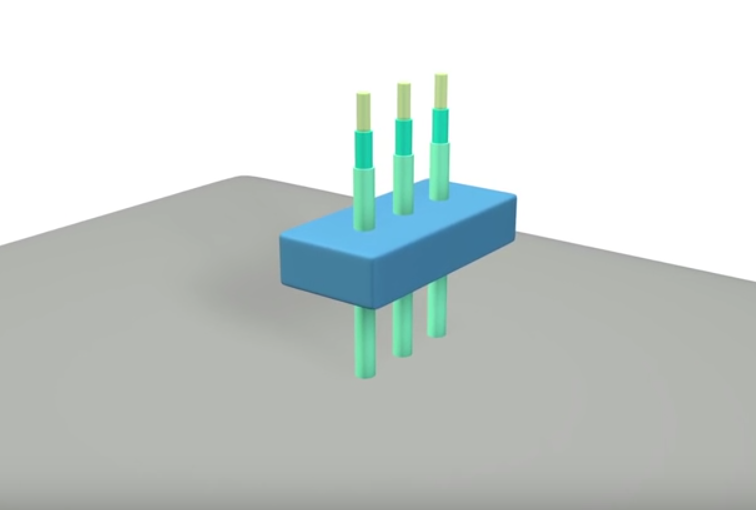 In this movie, we visualize the evolution of a FinFET architecture into the next technology generations: from tall Si fins and source/drain stressors over "
In this work, ferroelectricity is identified in nanocrystalline BiFeO3 (BFO) thin films prepared by low-temperature atomic layer deposition. A combination of X-ray diffraction, reflection high energy electron diffraction, and scanning transmission electron microscopy analysis indicates that the as-deposited films (250 °C) consist of BFO nanocrystals embedded in an amorphous matrix. Postannealing at 650 °C for 60 min converts the sample to a crystalline film on a SrTiO3substrate. Piezoelectric force microscopy demonstrates the existence of ferroelectricity in both as-deposited and postannealed films. The ferroelectric behavior in the as-deposited stage is attributed to the presence of nanocrystals. Finally, a band gap of 2.7 eV was measured by spectroscopic ellipsometry. This study opens broad possibilities toward ferroelectric oxides on 3D substrates and also for the development of new ferroelectric perovskites prepared at low temperature. Figure. Schematic diagram of an ideal surface coating layer on active materials. 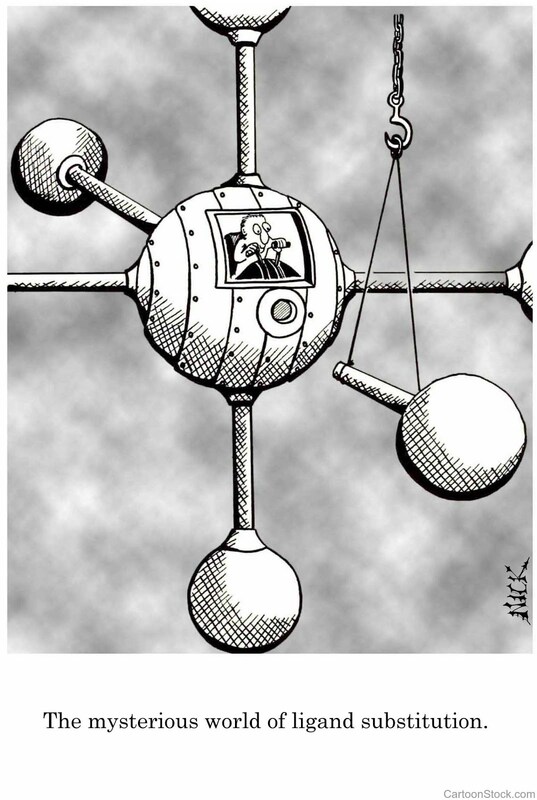 Image provided by Xueliang Sun. The essential characteristics of an atomic layer deposition (ALD) reaction are the sequential self-limiting surface reactions to achieve conformal thin films with sub-monolayer thickness control. This advantage over other deposition processes renders a wide range of applications. While ALD was conventionally applied mainly in semiconductor electronic industry, recently, it is receiving increasing attention for wider applications in energy, environment, and sustainability research, with the advance in recipe development. 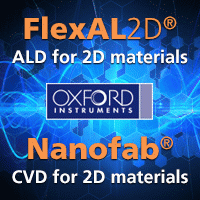 This focus collection will centre on the increasing importance of ALD techniques in developing innovative nanoscale materials, processes, devices, and systems relating to energy and environmental applications. Original and Review work detailing the development of energy nanomaterials and devices, including photovoltaics, batteries and supercapacitors, fuel cells, photocatalysts, and photoelectrochemical cells are solicited. Additionally developments in nanophotonics, including applications of ALD in new plasmonics, nanoscale laser, and metamaterials research are included. 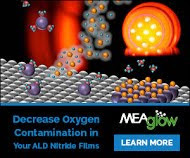 Interest of this collection also extends to innovations in chemical and biosensing using ALD, for example, organic pollution degradation, surface plasmon sensors, and quantum dot biomarkers. We hope this issue provides a broad overview of the current state and guidance to the future. The 2015 market for dielectric precursors is expected to total $230M, of which over 25% is attributed to low-k dielectrics, according to the new 2015-16 TECHCET Critical Materials Report on Dielectric Precursors. New players are getting into this growing market, where SOD still represents ~50% of total revenues. Multi-patterning schemes and high aspect ratio features in both logic and memory devices are driving the adoption of novel low κ dielectrics, innovative gap fill processes and sacrificial layers to support integration of FinFET's and advanced Flash and DRAM capacitor stacks. Click here for details on how to get the Dielectric's Report. Precursor revenue by type, see report for details. TECHCET's 2015 Dielectric Precursors Report provides strategic information on the dielectrics market, including revenue by precursor type/application, and market share ranking. It also includes critical information used to ensure business continuity and support category management of the CVD, ALD, and SOD dielectric markets and their supply chains. In addition to business and technology trends, supply chain, and geopolitical issues that impact dielectric precursors are also discussed in this year's report. TECHCET Celebrates 15 Years of Critical Materials! 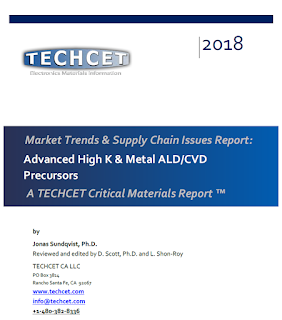 In celebration of fifteen years of Critical Materials Reports, TECHCET is offering a special price on Report Advisories. Report Advisories on Gases, CMP, Wet Chem, Targets, Dielectric, and Si Wafers are discounted 30%. Advisories include the TECHCET Critical Materials report, Quarterly Forecast Updates, Supply Alerts, Updates on China raw materials, Supplier Profiles, Technical Trends, and more. 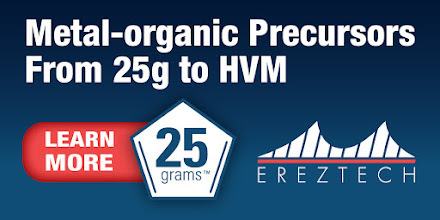 The promo code 15CMRA2015 is good until November 27, 2015.